You can believe anything and be a Methodist, just so long as you're sincere. Such a misperception has deep historical and cultural roots. Explore a basic explanation of the beliefs and practices of the United Methodist Church as defined in Part II of The Book of Discipline. 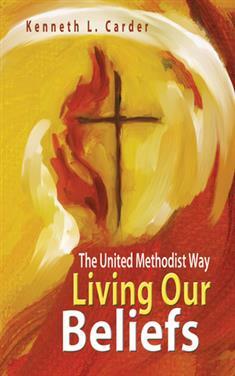 Uncover a deeper understanding and experience of Christian faith as you embrace the United Methodist way. "Beliefs are to be lived; doctrine is to be practiced," writes Carder in this updated edition of his 1996 bestseller. "The authenticity of beliefs lie in their ability to shape people and communities into the image of Christ and to promote holiness and happiness. …The important test of the validity of doctrines and beliefs for United Methodists is the kind of character they produce in individuals and communities and the actions they inspire in the world." Living Our Beliefs is essential reading for new members, confirmation classes and small group studies. As one reviewer says, "Bishop Carder invites us to both understand and live our beliefs. With deep understanding of Wesley's teaching, he inspires us to practice what we preach. That is the United Methodist way." The Leader's Guide for this course, Living Our United Methodist Beliefs, by George Hovaness Donigan may be purchased here.